If you haven’t made pasta at home, it’s time for you to begin, starting with this sweet potato gnocchi recipe. Don’t be intimidated, though. I’ll give you step-by-step instructions on how to make it. It might seem like a long process but it’s really simple. All you gotta do is to keep calm and follow the recipe. Gnocchi is a type of Italian pasta that is customarily made from wheat flour, semolina, potato, egg, and cheese. You can be versatile and replace and/or add other ingredients to give your gnocchi more personality as well. For example, adding different kinds of herbs to the gnocchi will give the dish a lot more flavor. Like any other pasta, gnocchi can take many different shapes and sizes. In order to shape the gnocchi, the dough is rolled out into a thin log and cut into small pieces, thus resulting the gnocchi taking the shape of tiny pillows. You can opt to either cook the pillow-shaped gnocchi at this stage, or shape them even further by pressing the gnocchi gently with a fork to form ridges on the gnocchi. This will help them hold sauce more effectively. 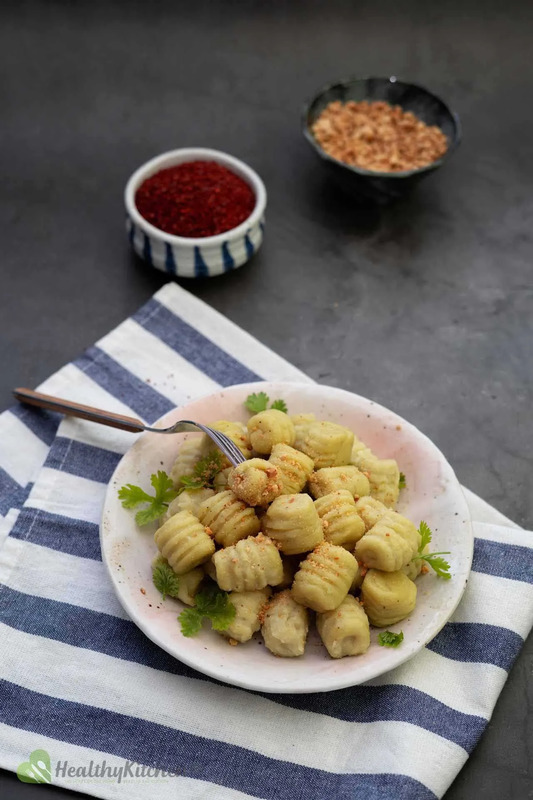 There are many ways to serve gnocchi: it can either become a main course like your favorite pasta, or take the role of a side dish to accompany any type of protein like beef or pork. Generally, after being cooked in salted boiling water, gnocchi is cooked in melted butter with sage until they are crispy on the outside. Alternatively, gnocchi can be dressed with various types of sauce like pesto, alfredo, bolognese, etc. What Does Good Gnocchi Taste Like? If you have never tasted gnocchi before, this will be hard for me to describe, but I’ll try my best for you. As mentioned, gnocchi are small delicate balls of dough that have a very interesting texture; it lies somewhere between soft and pillowy, but not airy. It’s also tender, kind of fluffy, and silky smooth at the same time. In other words, it’s better for you to have a taste to actually feel what it’s like. If you gnocchi turn out tough, or chewy, or doughy rather light and fluffy, I’d have to guess that you have done it wrong, my friend. No worries, though. Practice makes perfect. Yes, you can. Any food can be overcooked if you’re not paying attention. Like cooking pasta, it’s always best to set up a assembly line when you cook gnocchi: a pot of salted boiling water, a pan of your favorite sauce or butter right next to the pot, a strainer or a slotted spoon, and last but not least, gnocchi. So when the gnocchi are cooked and float to the surface, you can fish them out immediately and transfer them to the sauce pan right away. If you leave the gnocchi in the pot for too long, they will be overcooked and turn into mush as they take in more water, which is something we would all like to avoid. Can You Freeze Sweet Potato Gnocchi? In order to freeze your sweet potato gnocchi, place them in a single layer on a baking tray. If you have too many gnocchi but only one baking tray, lay a large piece of cling film over the first layer and arrange the second layer on top. Once finished, put the tray in the freezer and let it sit for about 3 hours or until your gnocchis are completely frozen. Once solid, take them out and put them in a ziplock bag. Keep them in the freezer and they will stay good for a month or two. How To Cook Frozen Gnocchi? Don’t thaw the gnocchi before you cook them. Thawing them will release their moisture, thus making the gnocchi mushy and sticky. Use a big pot with lots of water. You need to give your gnocchi some space or they won’t cook evenly. Shake off all of the excess flour from the frozen gnocchi before you dump them into the water. If you skip this step, your gnocchi will likely stick to each other, and we want to avoid that. Don’t overcrowd the pot; cook them in batches instead. If you crowd the pot, the temperature of the water will drop very quickly and will take some time for to come back to a boil. By the time your water came up to temperature, your gnocchi will likely be mushy and fall apart. So, that’s basically everything you need to keep in mind before you start making your very first gnocchi. I cannot think of a better activity to do on a breezy Sunday morning than to make some sweet potato gnocchi. Peel the skin off the sweet potato and cut it into 1 inch chunks. Add the chunks to a pot and cover with cold water. Turn on high heat and bring to a boil. Keep boiling for 15-20 minutes or until the potatoes are fork tender. Drain and transfer the sweet potato to a large mixing bowl. Then, add salt, pepper, ground nutmeg, and almond milk. Mash everything together until smooth with a potato masher. Add flour to the mashed sweet potato and mix well to combine with a wooden spoon. Then knead for a minute with you hands to form a dough. Transfer the dough onto a clean and lightly floured work surface. Using a knife or a pastry cutter, cut the dough into 4 portions and roll each portion into thick ropes. Then cut each rope into small 1-inch pieces. Optionally, to make ridges on the gnocchi, place each piece on the tines of a fork, gently press it down while rolling it across the fork with your thumb. Sprinkle some flour over the gnocchi and set them aside. Boil a large pot of water. Add salt. Once the water is boiling, drop the gnocchi dumplings into the water, about 10-15 pieces at a time. Once they float to the top, cook for another 2 minutes and then remove them out with a slotted spoon. Once removed from the water, transfer them directly into a pan heated with olive oil to crisp them up a bit (optional). Serve gnocchi in a warm dish with desired sauce. This looks so yummy, can’t wait to try this.